Tim (KE7TAC) and Dale (K7FW) made a quick trip to the repeater site in order to add water to the batteries and download data from the new sloar charge controller. It was a wet morning and as we got high on the mountain the temperature dropped and every now and then we could see that there was a flake of snow mixed in with the rain. The flat portion of the road up high was running water and the culverts beside the road were carrying a pretty good flow. The battery voltage was 12.49 and specific gravity was 1.275. The batteries consumed quite a bit of water. Probably down about half way to the plates. We need to bring another gallon of distilled water on the next trip up. I read the documentation (help file) for the msview software before this trip so Tim and I were able to download the charge controller data to Tim's laptop. 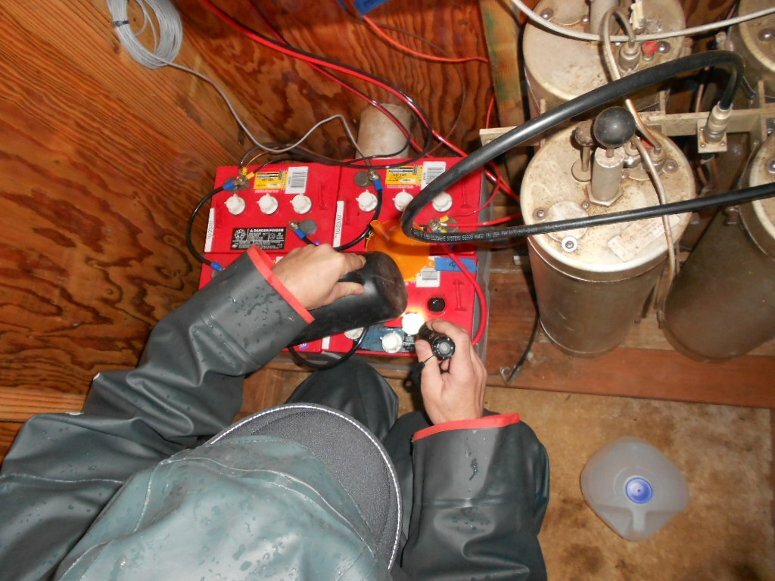 See this link for information about charge controller data. Here is a "birds eye" view of the battery filling. 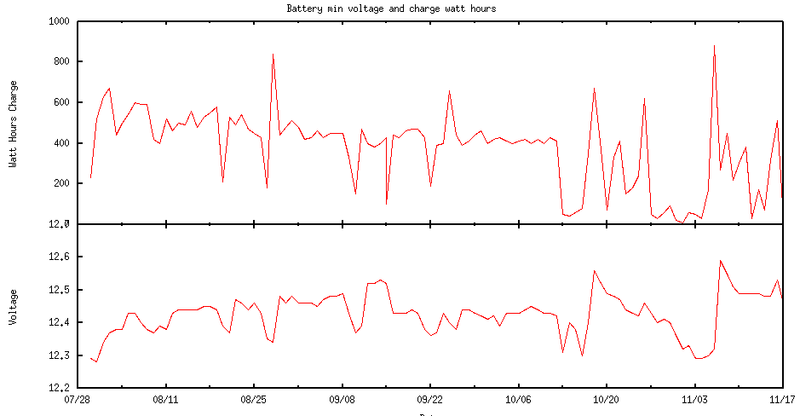 And here is a plot of daily minimum battery voltage and watt hours of charge given the batteries since controller installation. The date format was altered such that no time information appeared. Any commas in the second column were removed. set multiplot layout 2,1 title "Battery min voltage and charge watt hours"
set ylabel "Watt Hours Charge"